Metal Roofing - Performance Roofing, Inc.Performance Roofing, Inc.
How would you like the next roof you buy for your home to be the last one you will ever need? That’s the promise that can be made when you choose to install a metal roofing system from Performance Roofing, the expert in roofing Portland and Portsmouth-area residents rely on for top quality roofs and superior customer service. Designing and installing a metal roof requires specialized skills that are not commonly found in Portsmouth-area or Portland roofing contractors. Even those Portsmouth and Portland roofers who claim to have metal roofing experience often use inferior quality materials that cannot deliver the protection and long lasting durability you deserve for your home’s roof. Performance Roofing has developed a specific expertise in metal roofing, with hundreds of durable, reliable metal roofing systems installed on homes in Maine and New Hampshire. Working with the country’s leading metal roof manufacturers, including Everlast Roofing, we install only the highest quality, most durable metal roofing systems. The Everlast roofs we install are created with an industry-leading Heat Forming™ process that prevents microscopic cracks and allows for the use of more durable, scratch resistant coatings. The result is a metal roof that is stronger, more weather resistant, more damage resistant, and better able to protect your home from the elements over a longer period of time. FACT: Properly installed and insulated, a metal roof is actually quieter than an asphalt shingle or wood shake roof. In many cases the metal roof deck is separated from the underlying attic ceiling, providing an extra layer of noise-absorbing space. FACT: Today’s metal roofs are treated with corrosion inhibiting coatings that last for years. With minimal maintenance your metal roof will retain its great looks for as long as you own your home. FACT: A metal roof can actually be lighter in weight than an asphalt shingle or wood shake roof, and is much lighter than a built-up bitumen roof. Modern metals are made stronger, yet lighter than ever before. 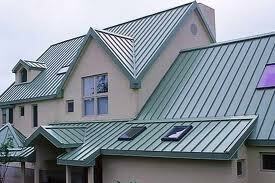 FACT: Initial installation costs of a metal roofing system are comparable to a quality shingle roof. But metal roofs last twice as long – or longer – than even the best shingle roofs, making the overall cost of ownership much lower for a metal roof. A metal roof from Performance Roofing is the best investment you can make in the long term safety and protection of your home and family. No other Portsmouth roofer or Portland roofing company can match the high level of quality, service and value that you get when you select Performance Roofing to design and install your metal roof. If you want to step up to a rugged, durable metal roof, or if you are interested in a high quality shingle roof, make the call to the roofing contractors Portland and Portsmouth homeowners rely on to protect their homes – Performance Roofing. Call us today at (207) 430-3868 to schedule a free roof inspection and written estimate for your Portsmouth or Portland roofing project or for roof repair Portland or roof repair Portsmouth. We serve York, ME, New Hampshire, NE, Dover, Hampton, Portsmouth, NH and other surrounding areas. For more information, click here.